Featured Photos with introductions to wonderful people in Fair Trade and Micro-Finance. The photos below are arranged by country. Nicaragua: On September 23, 2007, I interviewed Roger Silva at the Huebes Market, Masaya, Nicaragua. His story illustrates the need for micro-financing at reasonable rates. Sr. Silva has been helping his parents with their market stand since the age of ten. Since his mother became ill some time ago, he has run their sales place. He and his family are not artisans. Instead, they sell pieces the buy from others. When I asked him what kind of support he needs from the government, he quickly responded: “Laws setting limits on interest rates.” (Such laws are called “usury” laws in English.) He explained that there are no limits on interest. Therefore, when he borrows money from “the man” who comes around, he ends up paying as much as 20, 30, or 40% interest for a short term loan. Moreover, the lender (or the man representing him) comes around every day asking for a payment. 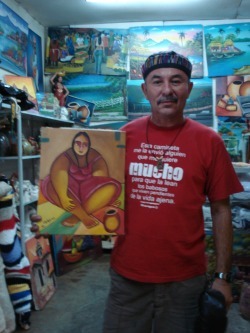 The painting he is holding shows “María Gorda” (Fat Maria). In a country in which people work very hard to be able to afford simple meals of rice and beans, rounded women are considered beautiful. 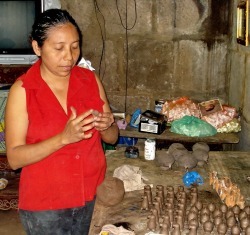 Nicaragua: Francis Caña of the village of San Juan de Oriente, Nicaragua has been making clay figures since she was six years old. She is one of the first recipients of a micro-loan through a new program established by the Fair Trade organization Esperanza en Acción . Ecuador: These people are members of the El Rosal Fair Trade Cooperative of the province of Imbabura, Ecuador. (Professor Stenzel is at the far right.) They makes soap, facial creams, and shampoo from organic ingredients grown in their own gardens. They are working to provide sustainable alternatives to strip mining for limestone in the ecological preserve in which they live. 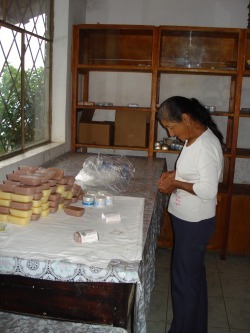 Ecuador: Packing soaps at the El Rosal Fair Trade Cooperative. Their packaging varies for each country in which they sell including Ecuador, Spain, Italy, and the United States. 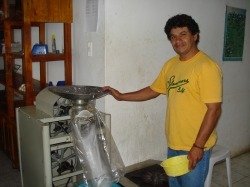 Ecuador: When the members of the El Rosal Cooperative started to make soaps, they used a kitchen mill to pulverize palm oil. This is the more sophisticated piece of equipment they acquired at a later date. Ecuador: Sr. Oscar Santillán is the current President of Agato, a small village of indigenous people in the mountains outside of the city of Otavalo, Ecuador. 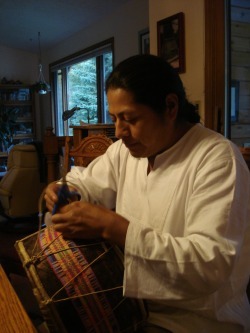 Sr. Santillán’s family has included musicians and healers over many generations, and he helps preserve the traditional and sacred music of the Quichua by making and playing traditional flutes, drums, and other instruments. Sr. Oscar Santillán is an active member of various indigenous organizations, and he works to help people, young and old, to understand the need for sustainable development in Ecuador through Fair Trade, micro-finance, and related tools. 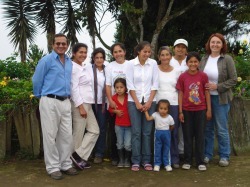 Sr. Santillán and his family are entrusted with care of Pakarinka Sisari, a “center for ancestral wisdom.” When the Spaniards came to Ecuador, they destroyed the temples and sacred musical instruments of the Quichua. Recently many of these instruments and other relics have been found, and more are being uncovered. The Santillán family is assembling a museum at Pakarinka Sisari to house sacred musical instruments and other artifacts.